I was happy to see many angels chanting in the sky. Our Lady appeared within bright golden light. She was wearing golden mantle, gold sash around her waist. She was accompanied by 3 Carmelite saints, ( St Therese of Lisieux, St Teresa of Avila and St Magdalen de Pazzi), St John, the apostle, St Faustina. “My children, I am your Mother of Love, Peace and Joy. I want to thank everyone who came from different places especially for my young children who are happy to join with their loved ones to pray here. It really comforts my Immaculate Heart seeing you here together in prayer. 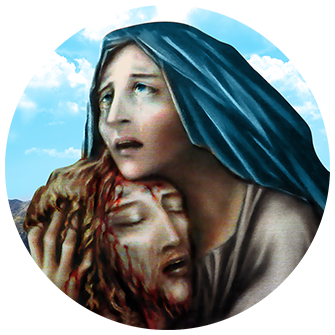 The Blessed Mother looked at me and she gave me a personal message concerning our country. Everything is in God’s Will and in His Time. I will bring your intentions to My Son Jesus. I love you my dear children. Our Lady disappeared, followed by the saints and angels.